From the moment she arrives at Miss Cackle’s Academy for Witches things begin to go wrong for Mildred Hubble. None of her spells work, she’s terrible at riding a broom and even her cat, Tabby, is an embarrassment. Things get even worse when Ethel, the teacher’s pet becomes her worst enemy and arranges for Mildred to ruin the end of term broomstick display. Certain that she will be expelled Mildred runs away only to stumble across a group of witches planning to take over the school. Somehow she has to stop their plot before it’s too late. Can the worst witch in the school save the day? Beautifully illustrated by the author, this is a wonderful series to read together and also for children beginning to read on their own. 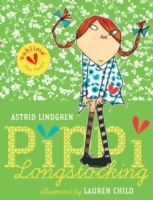 Pippi Longstocking has been enchanting children for almost 70 years. Delight in the brilliant adventures and escapades she and her next-door neighbours Annika and Tommy embark on. Lively, warm, funny and charmingly unique Pippi is everyone’s dream friend; the perfect companion. Whether to read aloud or by oneself, Pippi is unforgettable!